Delta’s Executive Vice President and CFO Paul Jacobson spoke this morning at the Cowen and Company Global Transportation Conference. He put up a standard Delta chart showing that customers like the airline more than their competitors, and so customers are willing to spend more to fly Delta. 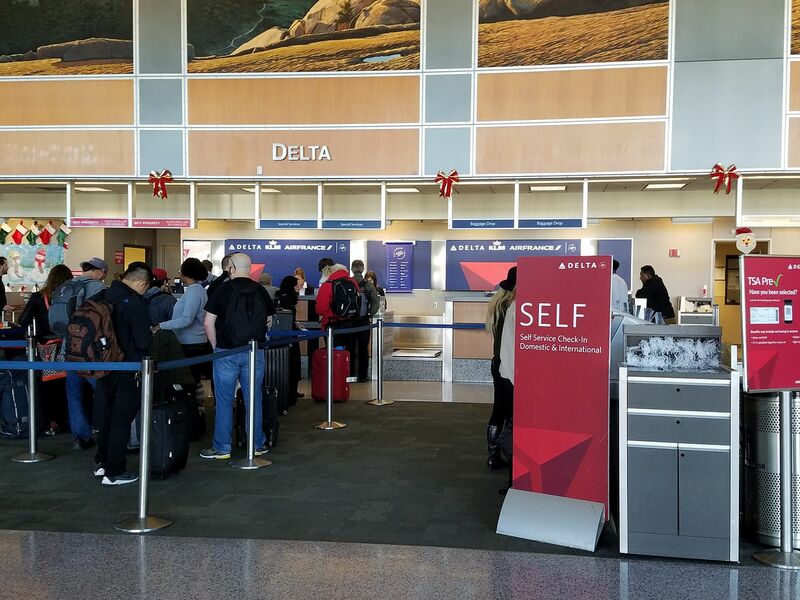 Delta runs a better airline operation than its peers. The key here is Delta TechOps, which keeps Delta’s older fleet running more reliably than newer planes at other airlines and has also become a significant profit center for the business. Their flights are more likely to run on time. They rarely cancel flights. So they don’t need to spend as much marketing or enticing customers to fly their planes (SkyMiles). And their super operational performance has even encouraged customers to stick to the Delta brand for their credit card and mileage earning despite offering a less valuable currency. Jacobson offered this startling statistic. Delta had 5000 cancellations due to maintenance in 2010 and this year there will be “fewer than 100.” He says that’s “down 99% since 2010” although it strikes me that the actual numbers could wind up down only 98% as the year finishes. He also notes that “A0” — arriving exactly on-time — is the one thing most highly correlated with customer opinions revealed in Net Promoter Score. Their maintenance team drives their ability to deliver on-time arrivals (in contrast to airlines that focus on on-time departures without necessarily having the operational performance to deliver it, those same airlines see Delta as better-run so copy other cuts Delta makes to SkyMiles without seeming to realize Delta does it because they achieve on other margins). Helane Becker, hosting the event, asked Jacobson about the plans for Delta’s TechOps as a billion dollar business with high margins. Jacobson noted that the margins “dipped a couple of years ago” but sees those improving and achieving “well over $1 billion in revenue.” Notably end of 2017 Delta’s order of 100 Airbus A321neos along with 100 options was done in conjunction with a Pratt & Whitney engine overhaul deal so that other airlines pay Delta a tax over time on their aircraft. They are just a better airline than UA or AA. Period. I am a loyal AA flyer but a pal of mine is DAL. When he tells me what delta does to fix stuff for him when the airline messes up or he makes a mistake in a booking I am impressed. Meanwhile with AA even if the agent not only wants to help me, even volunteers to help me (even when I haven’t asked or said a word) , they usually come back with an apology saying they can’t actually help me bc the system won’t let them. @ Gary — They will be come a victim of their own arrogance. I am not paying 15% more to fly on the exact same crap that AA and UA offer. I have found their pricing to have become insulting lately. They really aren’t better when it comes to what matters to me — aircraft. The still fly “crap airplanes”. Its not just Tech Ops. Staff are happier and more empowered (related concepts). Interiors are better maintained and better equipped, even on older planes. The other 2 can learn something here. I agree with Tom. I have 2 million miles in with United and I fly out of SFO which is a natural for United. And United has a better loyalty program in terms of global upgrades and award travel. Still, I choose to fly Delta – everything is better at least in first class: bottled water always at the seat before departure; pre-departure drink always offered. From customer service, to the club, to the gate agents, to the flight attendants, the people are friendly and more helpful. I had to make a decision: fly the better program or fly the better airline. I chose to fly the better airline: Delta. I don’t understand the last sentence. Or even how the ops team can be a profit center. Can you elaborate? Does Delta outsource any of their maintenance overseas like the aa maintenance people are concerned about? From a premium passenger perspective, there isn’t as much difference between DL, UA, and even AA on most of the routes I fly. First, DL doesn’t fly many of the routes I prefer (or flies them at a terrible time for me, such as too early for LAX-DCA on DeltaOne). Second, in the rare instance when DL does fly the route I want, it isn’t always price competitive with JetBlue Mint or has no better premium seat than is offered on UA or AA. Third, DL miles just aren’t worth much–and I can earn then via Amex Membership Rewards whenever I need them. But it takes so many more DL miles to get anywhere that it’s almost never a good deal. I often get decent deals with UA miles on UA metal, as well as other *A carriers in premium class. I often get decent deals with AA miles on AA metal. I almost never get a decent deal with DL miles on DL metal, especially with premium seats and never with DeltaOne. I suspect UA will catch up first, as I already find UA largely competitive with DL on many of the routes I happen to fly. The food on UA is pretty comparable to that on DL, and I prefer the IFE on UA flights. I still would take JetBlue Mint over all of them, though. @ Gary — Bill makes a good point. I am a premium passenger. (Remind me, what is economy? 😉 ) If I was flying economy, perhaps I would be willing to pay more for DL over AA and UA. I can’t really tell you what that experience is like, as I haven’t flown economy for a few years now. All of the US premium cabins are pretty much the same crap — vastly inferior to most international carriers — so I kind of view it as all the same. Gary, why don’t you do a little reporting about how DL ‘fudges’ their cancellation stats? It’s easy to have the best completion pct in the industry when they delay a flight 15hrs into the next day even after everyone has been rebooked so they can claim that the flight flew. It’s all smoke and mirrors in the ATL. Pay more to fly on a 25+ year old MD-88/90, 757, 767, classic. @ mike — Precisely my point. Delta is a cattle car! While I think you’re too hard on AA, I think you’re too soft on DL. I fly all 3 airlines all the time. It is very hard to have a REAL preference for one or the other. They are WAY more similar than they are different. I would agree that, ignoring status, I like flying DL slightly better, at least in coach. But in thousands of flights, I have never paid DL a dollar more to fly them. And I suspect there are only a very small group of travellers who have. Like almost all frequent travellers, I almost never have an “equal choice” between these carriers. One will ALWAYS offer me a faster routing (nonstop v. connecting), a more convenient flight time or a lower fare. Or the elite status I have will tip the scale. I NEVER have a near equal choice where I can say “Since DL has a slightly better flying experience, I will pick them.” You are listening to too much DL PR if you think DL’s extremely marginal “better experience” is driving more revenue toward them. Cancellations aren’t the only cause of dissatisfaction. Had a issue where flight to Atlanta was delayed by a couple of hours and because the connection was missed we were stuck in th originating city overnight. So as far as delta is concerned there was no cancellation of a particular flight however we were rebooked to the next day – in my book that is a cancellation that does not show up on any DL performance stats reported to DOT. I’d rather be elite on a “subpar” legacy carrier like AA is where I have multiple rebooking options versus no status on DL’s “premium” experience where you are stuck in ATL with any delay. Do the cancellation statistics include the Delta Connection, or are those flight statistics listed separately? Does the reputation of the airline being operated well include Delta Connection? I agree with some of the others. I had a situation a few months ago where my Delta flight was “delayed” repeatedly all evening first for mechanical, then to get a crew, and finally after hours of getting reset departure times in chunks of a half hour or hour at a time, we were taken to hotels for the night. The flight operated the next morning under the same flight number but with a different aircraft and crew. Technically it was not “cancelled” in the statistics, just 15 hours late, but it sure felt like a cancellation. For me all three of the main domestic carriers are pretty much equally poor and unreliable. As someone noted, “all else being equal” is seldom the case, but if it were I’d go with United for its award program, with better coverage and availability internationally and no carrier imposed surcharges. I agree that DL believes their own press releases. I used to fly them (live in a DL hub city) and then moved to an AA hub city. I could still fly DL but their prices were nearly half or double AA’s and for the exact same service. I hadn’t flown DL in years and just recently used of my remaining miles. WOW, after hearing how wonderful DL is, I was not impressed. AA’s boarding is more organized and quicker, the seating on the plane was awful (MD90 and 737s), plus the 3 out of 4 flights were late and no it wasn’t weather related. Plus, the flight attendants completely missed our row during service (we were awake) and when I said, you missed our row, they were all. . we will get to you and never did. AA hit rock bottom a year ago and the onboard crews have improved during the past year and hope they continue to do so. The AA hard product is as good or better then DL (and yes DL uses the same mini-bathrooms that AA has. .as does AK UA and SW so don’t start that rant). I used to love DL and was not impressed and sad to see the decline in service. I do have a choice and right now it’s AA. Yeah right, and coffee is bad for you till it’s good, and mother’s milk is bad for kids cause the big guy knows nothing about animal husbandry. I’ve been flying for about 35 years and this article is extremely hard to believe. BTW we don’t call them Sky Pesos for nothing. My next move is to DAL. I have a lot work to do over there to screw it all up, after all I’m 2 for 2 from past & current experiences. @Dug, will you vouch for me? well I do think Delta has done something better than AA, I am not gonna spend more money to fly delta.